As solar job growth continues to grow exponentially, it’s time for government leaders to help ensure that expansion continues. 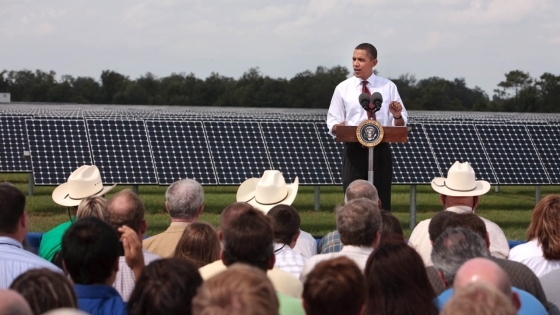 President Obama has vowed to do that, launching a new initiative to expand the solar industry workforce and train 75,000 new solar workers by 2020, according to the Washington Post. This new solar initiative involves the Energy Department training 75,000 people, including veterans, for the solar workforce within the next five years. The Energy Department will also team up with the Pentagon to run the “Solar Ready Vets” program. This program preps veterans to work in the solar industry at 10 military bases across the U.S. Besides the military training program, community colleges were already included in the nationwide solar instructor training network. So far, a pilot program of the initiative has already been underway at Camp Pendleton, and of 20 Marines who participated and completed training, every single one got at least one job offer from one of the top five major solar firms in the U.S. It helps, of course, that these firms are recruiting from this program, but it still shows that the program is working, since it teaches participants how to install solar panels and electrical systems, as well as interpret building codes and inspect systems. It also provides an excellent field for veterans to showcase their skills and be supported in a civilian job. Given that solar is adding jobs so much faster than the rest of the economy, it simply makes sense to train people looking for work in construction and installation. With over 6,000 megawatts (MW) of solar photovoltaics installed last year — enough to power 1.4 million homes in the U.S. — the demand for solar is high, and it’s a good sign that the government wants to invest in its future. All of this also ties into Obama’s executive order to have the federal government cut its greenhouse gas emissions by 40 percent over the next 10 years, in addition to increasing renewable energy by 30 percent in the same decade. This, in turn, has led to federal suppliers like General Electric and IBM to reduce their carbon footprints over the next 10 years. Whether they’ll turn to solar energy or another renewable energy source remains to be seen, but it’s a positive step towards increasing the use of renewable energy overall instead of relying on traditional energy sources. What do you think of this solar job training program? Let us know in the comments!